When a mysterious meteor shower populates the streets of south London with hostile aliens on Bonfire night, a street gang must defend their council estate from these strange invaders. Moses (John Boyega), Biggz (Simon Howard), Dennis (Franz Drameh), Jerome (Leeon Jones), Pest (Alex Esmail) and Nurse Sam (Jodie Whittaker) amass an arsenal of makeshift weapons and band together for survival. Can they last the night and emerge triumphant? 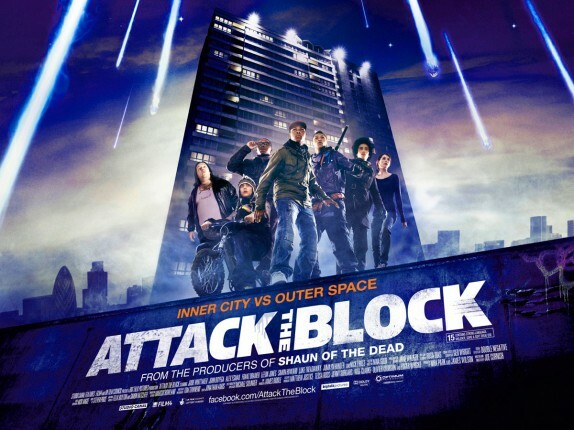 Attack the Block is a patchwork quilt of various sci-fi and horror classics. Its most immediate and obvious influences are readily apparent. One can instantly sense a kinship with the Spielberg produced classics of the mid 1980’s such as Gremlins and Goonies, and there’s also a hint of Night of the Creeps, Monster Squad, and Critters. Attack the Block skillfully crossbreeds those minor populist classics with other more “respectable” genre standards such as A Clockwork Orange, Aliens and Night of the Living Dead. It manages to splice all of the aforementioned into a brisk 88 minute romp that manages to entertain the hell out of its audience in a most efficient manner. There's never a clear and uninterrupted look at the creatures. They are lithe and move with ferocious speed. They could just as well be a pack of wild zoo animals let loose on an unsuspecting populace. The kills are shown through a series of shots and edits that would be unforgivable in a more “serious” action film, but Attack the Block is a genre exercise of a different sort. Like its teenage heroes, the film takes a makeshift approach to the action and money shots. It employs whatever means are necessary to achieve the desired effect. When the nasty beasts enter the frame, the tension is palpable and the suspense feels real. The creatures themselves are a triumph of simplicity in both conception and design. Physically, they resemble the title creature from An American Werewolf in London. They are covered from snout to tail in impenetrably black fur that renders them nearly invisible at night. They also have multiple rows of glowing, razor sharp teeth. So many modern monster movies offer audiences over-designed creatures that are meant to be remembered and admired. Attack the Block simply offers up snarling, furry monsters that ravage anything in front of them. My only complaint revolves around the quality of the CGI, which often makes the creatures look like blurry black silhouettes without a distinguishable strand of the aforementioned fur on their bodies. Moses and his Motley Crew. As silly and unpretentious as the proceedings are, Joe Cornish manages to work in a few sincerely pondered themes. American street gangs often characterize themselves as defending their neighborhoods against intruders, when in fact they prey on their own territories more than any outsiders. Attack the Block places Moses and his minions in a situation where they are forced to reevaluate what it means to defend their block. That one particular theme manages to resonate in spite of the films otherwise irreverent tone, mostly due to the way the situation is presented. There is much humor afoot, but the situation itself is shown to be deadly serious. The film even manages to comment on the inherent distrust that minorities all over the world feel towards the powers that be. The most delightful thing about the film is its band of unlikely heroes. They are a street gang no doubt, but they are not particularly sociopathic or bloodthirsty. They speak in impenetrable cockney accents, and pepper their conversations liberally with profanity and Jamaican slang. They are a multiracial crew, with the black characters taking center stage. Both the hero Moses and the villain Hi-Hatz (Jumayn Hunter) are of African descent and have typically Negroid features. That’s something that likely will not be repeated in the inevitable Hollywood remake. Attack the Block is the most entertaining film of its kind to come along in quite a while. It transcends its meager ambitions and proves to be more skillful than anyone could imagine. I truly feel for the dead soul who can manage to somehow not be entertained by this film. Hopefully there will never be a sequel or a Hollywood remake. 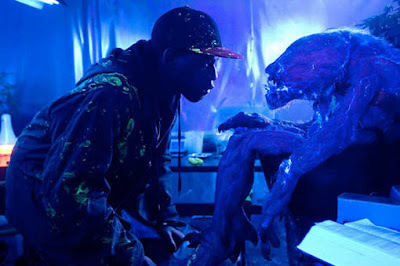 Attack the Block is perfect as is. Its story doesn’t need to be continued or rehashed, just enjoyed by all and watched repeatedly. The smartest, funniest cheap monster-movie import this side of June's "Trollhunter," Attack the Block is a near-perfectly balanced seasonal trifle: Anchored in social realism yet determinedly goofy, it's neither too eager for laughs nor overtly preachy.